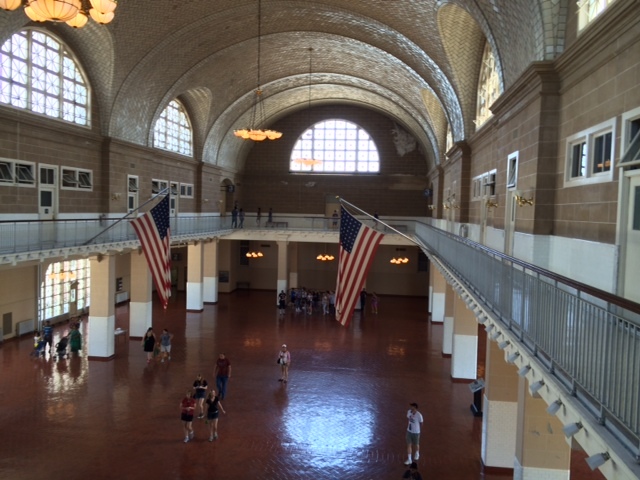 Like many New York-area residents, I have never been to many of the tourist meccas like Ellis Island. And since three of my four grandparents were immigrants, I decided on a beautiful Sunday morning recently to see the ground zero of 20th century immigration for myself. The great thing about a visit to Ellis Island is that the only way to get there is by boat. Of course, that’s the way it’s always been. Between 1892 and 1954 immigrants arrived at Ellis in boats from all over the world. The boats today run a route that includes Liberty Island along with Ellis Island on every trip. So even if you just want to see Ellis Island, you get a free trip to Liberty Island thrown in. 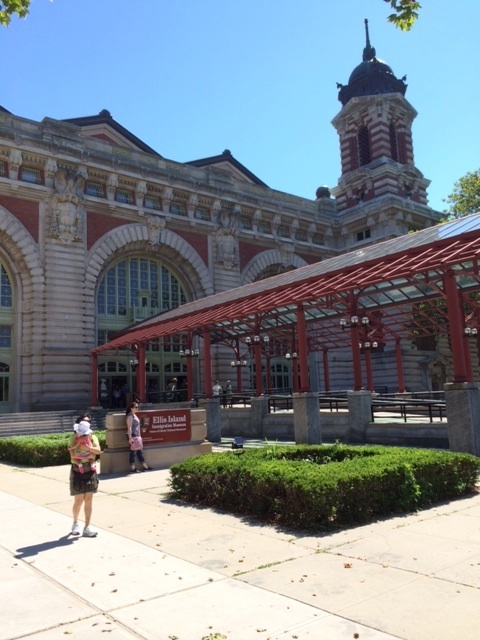 Ellis Island was hit hard by Hurricane Sandy in 2012 and some exhibits are still not back. But what’s there is gold. There are artifacts galore and you can tour the great hall where immigrants waited to be called up to be interviewed. You can see where they ate and where they slept. You can see an above-average orientation film that tells the full story of American immigration. And they don’t try to cover up America’s checkered acceptance of immigration. There are whole exhibits to “nativist” hostilities to every immigration group. For some, like the Asians, the dislike was codified into laws that forbade immigration altogether for decades. But what surprised me most about visiting Ellis Island was the people who accompanied me on the boat. It seemed to me that the vast majority of my fellow visitors were immigrants themselves, or perhaps simply tourists from foreign countries. English speakers were definitely in the minority. And this dismayed me. It seems to me that it would do many native-born Americans good to see the lengths our ancestors went to to try to deal fairly and humanely with immigrants. From my reading of history, and from the exhibits at Ellis Island, I know that the people who created and worked at the facility were not all big fans of immigration. Yet they followed the law, and I suspect they even bent the law sometimes, to give many needy people a shot at the American dream. The key, of course, was that the laws during the time Ellis Island was operating either allowed unrestricted numbers of immigrants (as long as they were healthy and could prove they had a way to support themselves) or set the ceiling on the number of immigrants high enough that people did not have to wait years or even decades to come into the country legally. The tour guides at Ellis Island go to great pains to explain that not everyone who came to Ellis Island got to stay in the country. If you were found to have any disease or were otherwise “unqualified,” you would be sent back to your home country. In fact, a member of my family who was found to have tuberculosis was sent back home. He would return to the United States years later after being cured of the disease. I think that anyone who visits Ellis Island comes away with two thoughts: (1) it was a tough, nerve-wracking way to come into the country but, (2) the process was designed to be fair and efficient and it was that most of the time. One of the rooms you can visit is the make-shift courtroom where immigrants who were being denied admission could have their cases reviewed by administrative judges. The hearings went on all day, every day. Many were able to convince hearing examiners that they were being denied entry unjustly. Contrast this to the detention facilities we have today for unqualified immigrants that provide no right of appeal. Clearly the immigration situation today is much different than it was 100 years ago. But when you visit Ellis Island, in the shadow of the Statue of Liberty, you can’t help but be thankful that Americans then, while not being crazy about the hordes of immigrants filling up New York City, were compassionate enough and intelligent enough to let them in, in the hope they would contribute to the country. Essentially, in those days, America made a bargain with the world. You can come here if you promise to work hard and help make America a better place. Even the most ardent immigration opponent would have to agree that the immigrants who came through Ellis Island between 1892 and 1954 kept their side of the bargain. Are we sure that the thousands of people we turn away today because of ridiculously low limits on the number of immigrants cannot similarly contribute?